Alliance Sales consolidates and streamlines the selling of equipment and services, from quote generation through order processing, at all points of customer contact, including outside sales, inside sales, contact center sales, and field service sales. Alliance Sales consolidates and streamlines the selling of equipment and services, from quote generation through order processing, at all points of customer contact, including outside sales, inside sales, contact center sales, and field service sales. By enabling your sales organization to leverage both sales and customer service data, Alliance Sales drives smarter, more informed business decisions throughout entire customer lifecycles. Whether for field sales or internal sales teams, the suite provides agents with independent access to real-time data, leveraging the service knowledgebase for convertible opportunities, short sales cycles, profitable margins and high close rates. Consolidated views of sales and service data provide a clearer understanding of operations, enabling a bigger picture perspective to drive strategic decisions. 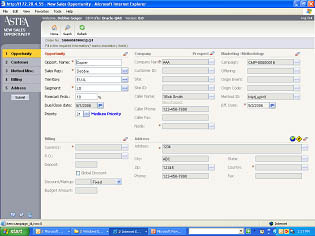 Account management for automated assignment and tracking of prospects by industry, etc.